I'm up at the usual early time, but with an easy ride in front of me I'm slow getting out the door. I'm finally rolling at 8:30 in the morning. Before leaving town, I buy six of the ring rolls, but for the first time these breakfast staples are tasteless and hard. Today's ride to Hama should take me by Qal' at Shayzar-a city that Lonely Planet describes as " the best of the dead cities,"-but after yesterday's circuitous tour, I have no faith in my map. Just before noon, approaching another non-descript town, I see this wonderful fortress on the skyline. This must be Qal'at Shayzar, a.k.a. Sergilla. I ride through the small town at the base of the hill, then up the slope. There, at the top, is a big, serious-looking fortress. There's no admission booth, and only a few visitors. There is one team using donkeys to carry up cement, and another archeological team, digging, so this location seems primed to become a tourist destination. After a half hour or so I return to street level, unlock my bike and continue the rather boring ride to Hama. 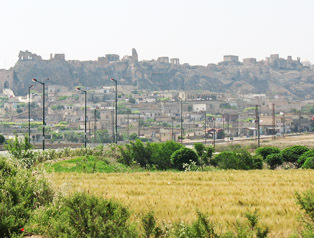 On the outskirts of Hama, a few signs point toward the central district, but within minutes I'm lost. I do my "stop and look lost" routine but no one comes to help. Per my guidebook, Hama is known for its ancient waterwheels, so at the next intersection I call out to someone and pantomime a waterwheel. The man fails to understand what I want. Eventually I get a tidbit of data, "3 kilometers," and a hand pointing down yet another road. I take out my compass to try to keep track of where I am. After 20 minutes of zigging back and forth across this town, something clicks, and I'd pointed down yet another road and look for, or ask for, the clock tower. The tourist hotels are right there. Sure enough, they are. LP is bullish on both the Riad and the Noria Hotels. I roll into the first one, and I find the whole experience wonderfully easy. The first room I'm shown is quoted at 350 or 450 Syrian Pounds (I forget) without a bathroom and it's very clean, but I ask for a room with more light. I'm offered a double with no bathroom for 600 (about $12). I'm encouraged to bring my bike up and even put it in my room. The hotel does laundry and it has a load going in at 50 cents a piece. Everything's coming together! I ask about biking to the waterwheels, and the manager laughs and says that they are just a few minutes away by foot and no bike is necessary. I shower, pack my day pannier and head out to get some food and do the tourist thing. As I head out, a petit Japanese girl is also heading out and I follow her down the stairs, introducing myself as we step outside together. She says that he name is Molly, and she turns out to be quite interesting. She travels alone and travels everywhere, and apparently travels on a very tight budget. Just as strange she's been to Hama before, about four years ago, so she turns out to be a good guide. We visit all four waterwheels, and loop the rather-bland citadel (really just a bare hill in the middle of town). She finds a beer store and focuses on getting a deposit back for the two bottles she's going to buy. The proprietor offers to actually open one there as we discuss whether Syrian beer is as good as Egyptian beer. I accept his offer to crack open a beer-the beer itself is very plain, but I get a kick out of drinking a beer in a beer store. I go to pay and he waves me off. Of course I pay, but the Syrian generosity I'd read about is very real. Molly explains to me that the banners and signage I've been seeing everywhere are up because there's an election in two days. Apparently voters will vote on whether they will reelect Bashar al-Assad, who took power seven years ago, after his father, dictator Hafiz Al-Assad, passed away. The concept of an election for a man who's supposedly a dictator seems… funky. But this pre-election energy doesn't seem like a show for the foreign press. For days now, I've seen signage everywhere-even on the front windows of moving vehicles! As we're walking around, the regular street-noise around us is drown-out by a convoy of thirty tanker-trucks cruising about, horns-a-blaring. Fifteen minutes later they cruise by again, still shaking the buildings with their horn-noise. 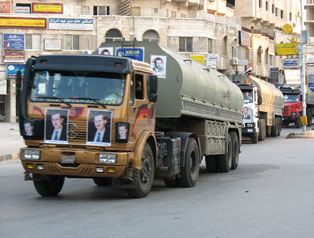 Even the Syrians are cringing at the noise. As we approach the hotel (it's dusk now), a street celebration is kicking into full gear around the bend, by the clock tower. I take a few photos from the hotel's roof then go outside. It's a lot of fun, and the energy seems genuine. Back inside, I corner the hotel manager, trying to learn more about the different car-trips the hotel advertises. I'm interested in getting a ride east to Palmyra, though I need to somehow get to Krac des Chevaliers, to the west, as well. The manager breaks away without telling me much: "We can talk about it tomorrow." I go crash. 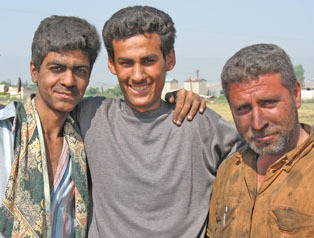 Syria's people are nicest, Jordan's a little stuck-up and in Egypt everyone's trying to get your money. For a woman traveling alone, Turkey is the toughest. Even on a half-empty bus, some guy will motion for her to take her daypack off the seat next to her, then take that seat and eventually begin touching her. They were processing some farmed product in a field just off the roadway - and covered in black soot as a result.. The skyline above the upcoming village indicated that I had come upon one of the "dead cities." 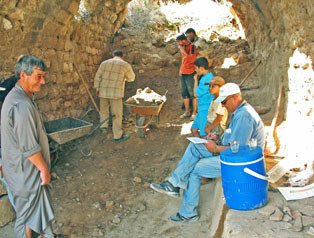 An Archeologist from the Idlib museum was managing a dig. 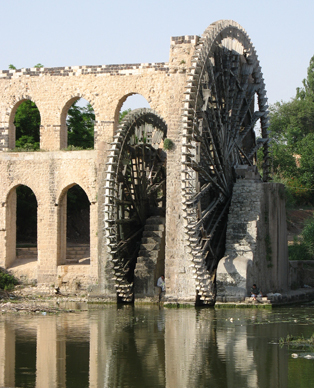 The famous water-wheels of Hama were well-worth a visit.. The truck horns were following me through the cities! 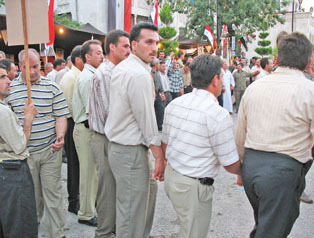 Syrian men line-dancing at the election festivities.